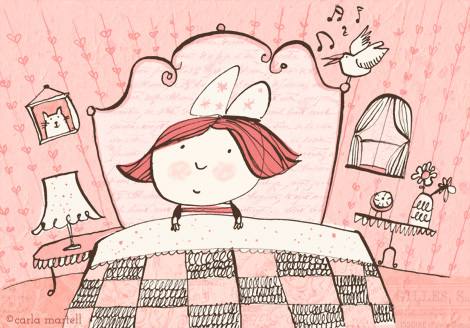 A quick little play with this week's Illustration Friday theme; a girl in her old-fashioned bedroom (I like drawing people sitting in bed, it means I don't have to draw their feet). I haven't been here for a while because we have been moving house, an event that seemed to go on for months. If you have ever heard anything about Auckland's hideously expensive housing market, you might know what a challenge house hunting can be. Especially if, like us, you're renting - and here I will stop before I launch into a rant! A rant about renting - that would be the longest, growliest post in the world. Hi Carla Happy to see your art again. Yes move its really a problem, but also exciting because you have to find new places for your stuff, specially your drawing elements, and where you situate your drawing board, look for a window with a good light... etc. Thanks Roberto! Haha, yes bicycles are very difficult to draw and I avoid them too. Feet, bicycles and most mechanical things!